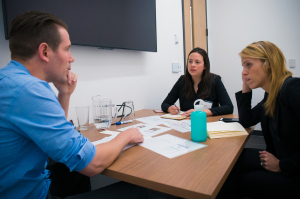 do a mid-program in-person week, and so this week our cohort companies from around the US and Canada returned to Boulder to connect with mentors, investors, our team and each other. This is the homestretch for this year’s program. MergeLane 2017 Demo Day is May 4th (Join us!). I held a casual dinner at my home for the team members who were in town, and at 8pm, I gave the co-founders of TinyHood a ride to their last mentor meeting of the day. Becky Miller and Susan Blinn — who are creating a system where parents can get expert real-time, personalized answers to their parenting questions — jumped in the car and rattled off the details of their day. As I listened, I realized how intense the accelerator experience can be and how amazing the community of advisors, mentors, and speakers really is. 11:00pm: Becky is responding to emails from the day and writing our investor update while Susan is fixing bugs….